The final and longest focal length semi-automatic Takumar and the least common. The junior member of the successful 135mm Takumar line of lenses, it was made for the shortest period in 9 batches each of approximately 500-1500 units. Marketing and sales campaigns are inevitably limited. Few sales brochures illustrate and describe it and at least one photographic writer overlooks it, completely. Put to work in astrophotography at "Cloudy Nights" it achieves a tick for sharp aberration free images. This lens and the Takumar 1: 3.5 / 135 (Model 2) that replaces it have the same optical design (5 elements in 4 groups) and are contemporary with Asahi Pentax S2, and SV cameras. They filled the gap in the market between the very popular first 135mm Takumar and Super-Takumar models which were sold in large numbers. Two kinds of construction exist; copies in batches 1 to 3 weigh less than those in later batches (approx. 309 versus 317g, respectively). All have 8-bladed apertures. Because the production period is short copies from different batches appear similar, cosmetically. None have a SN prefix, nor a infra-red focus mark (see Notes) and all have the same 11 available aperture settings. Nameplates are identical in style but two colour variants of distance scales exist. Distance scale lettering on early lenses is all white. Later copies use blue lettering for feet and yellow lettering for the metric scale. This lens weighs less but has similar dimensions to those of its Takumar and Super-Takumar successors. ; all white (early 309g lenses) and the new colour scheme (meters yellow, feet blue) for later, heavier lenses. The finger grip formula of the focussing ring is distinctive with 11 grooves between 8 finger grips; or F (11/8) in all copies. Early copies are sold with a brown leather case with a blue interior. Later copies are sold in a black leather case with green lining as illustrated. Lenses are supplied with cases and caps. A black metal lens hood is available as an accessory and is attached to the lens by threading onto the 49mm filter. Two forms of assembly are used. The early lighter copies provide access to internal elements by unscrewing from the front and lack external locking screws. Later heavier lenses disassemble from the rear. Three external screws in the barrel behind the focussing ring hold the front elements in place. Early copies weigh 309g and later ones 317g. Asahi Pentax SV camera brochures list the weight as 335g (11.8oz in Honeywell sales brochures), presumably, with filters and caps attached. From 1960 Takumars were given serial numbers without a prefix. Infra-red focus marks were introduced on Takumars, generally, from 1962. IR markings were trialled first in late copies of the first (M42) Takumar 1: 2.4 / 58mm. Honeywell catalogue details for accessories in 1962-65. Case Cat no. 812 [$5.95]; Lens Hood Cat no. 784 [$7.25]; Lens cap Cat no. 759 [$1.75]; Rear lens cover Cat no. 781 [$1.75]; Filters 49 mm [$6.95]. Australian prices for the lens hood, caps and filters were £2-9-6, £0-10-0 and £2-9-6, respectively. LENS PRODUCTION (∑ lenses) ∑n = 102 serial numbers observed in 9 Batches covering 5,451 SN min. < ∑ lenses < 7,818 SN max. Marketing of this final, and soon to be out-dated, semi-automatic lens is brief and tentative. It is out-sold by all the more popular 135 mm Takumars, preset and automatic, despite sharing the same optical design. Historically, it remains the Auto-Takumar with the longest focal length. In 1962 Asahi Pentax SV Sales Brochures illustrate both this lens and its predecessor. But later SV & S1a manuals list only the latter for sale. The semi-automatic is illustrated (incidentally) in Asahi Pentax SV & S1a Operating Manuals but the Takumar 1: 3.5 / 135 (Model 1) it's very popular and smaller pre-set predecessor is still the only lens offered. The short production period may have syncronised poorly with brochure printing constraints. 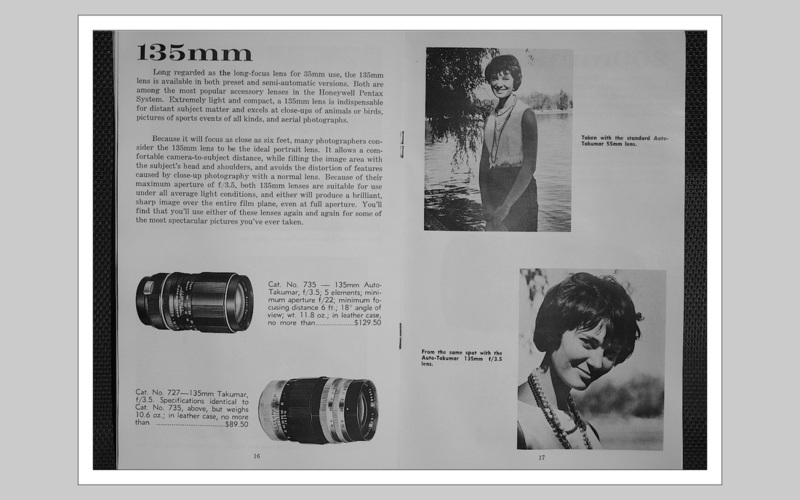 In 1962 in Australia this semi-automatic lens is sold for £31-15-0 (with a case) but it is unavaiiable by 1964. In the USA market by 1964 its list price is $US119.50; between $89.50 for the (newer) pre-set Takumar 1:3.5 / 135 (Model 2) and $149.50 for the latest Super-Takumar 1:3.5 / 135 (Model 1). The lens is advertised as discontinued in January 1965 and Fuhring R. (1965) continues to list the discounted price. Commercial brochures rarely illustrate or list this lens and then only briefly. Asahi Pentax SV Sales Brochures illustrate and list this lens and its predecessor as available for purchase. Asahi Pentax Operating Manual Models SV & S1a lists only its predecessor for sale but still contains an illustration of the semi-automatic version. Heiland Division, Honeywell (1962) Lenses for the Honeywell Pentax. FormH:2002 Markets the lens and its pre-set predecessor, illustrating and describing both on page16. Honeywell Photographic Products (1965) Lenses for the Honeywell Pentax. Cat No.748. January 1965. Lists the lens as discontinued. After discontinuation in 1965 the lens is lost to general literature for approximately thirty years. Emanuel W.D. Asahi Pentax Guide. Twenty-one editions of this booklet (1960-1981) don't include it. Cooper Joseph D. (1964) Pentax Pocket Companion. Second edition. The lens is listed early but lost from the fourth edition. Fuhring Robert (Editions 1962, 1963, 1965) "Pentax and single lens reflex photography." Contain Honeywell catalogue numbers and prices of this lens and all its accessories. The fourth and all subsequent (1967-1972) editions do not include the lens. "Honeywell Guide to Sports Car Photography" (1964) Promotes the lens (at the discounted price) alongside both its successors. Cecchi Danilo (1990) Asahi Pentax and Pentax SLR 35mm Cameras 1952-1989. Lists all Auto-Takumars except the 135mm version. van Oosten Gerjan (1999) The Ultimate Asahi Pentax Screw mount Guide 1952-1977. Contains a black and white photograph of a late copy and describes its characteristics.